Serve with my 93P, Return with my Blade 104. My guess is hdx/cream would be really good spin for those without sensitive elbows. Did you tried HDX/Cream or not? No ... by the time I tried hdx I had dropped poly including cream (which is ironic because poly in hdx). I found fb hdx a little more spin than fb v, and hdx/v a little more spin then origin/v. Based on that, I would expect hdx/cream to also have more spin than v/cream ... but you never know for sure how two strings work with each other until you try it. You have asked a lot of questions at this point. What strings have you tried at this point? If you break gut in 3 hours you should be on the ATP tour, and are wasting your time with nylon strings. Do you have your own stringing machine? But maybe it will last much longer!? I hope so!!! If you like gut/poly then I'd suggest Babolat tonic for longevity or Klip legend for value. Both will likely cost the same per hour on court. VS is overpriced. If you want a softer poly than Max Power, try either 18g or swapping to Cream. I've been playing some with Legend/Cream and its quite a soft experience. Not O/V soft, but pretty good for a poly. I used to get 15-20h easily with Tonic/4G in the old days of healthy tendons. It was my most durable setup. And if your arm can't handle that, then time to move away from polys entirely. Or get into an arm friendly racquet. Same experience with the black V 16g crosses. Does the Natural V do this as well? I find the natural V does less of this as the coating seems more abrasion resistant. As much as I love the look of Black V, I've totally switched over to Natural V. Stays slippery longer, less string movement. Mine (o natural 16/v natural 16) @55/52 never move that much ... even at 20 hours. I get some movement outside the middle 8 mains, but not bad. I get more movement with fb v ... but nothing like your pic. I changed fb v from fb 52 to 54/52 and it helped. I don’t mind my level of string straightening... but yours would drive me nuts. Does fb poly stay straight for you? What tension was your o/v strung at? Guys I'll be going with a Origin 1.25mm/Cream 1.23mm setup. Any suggestions on tension differential? 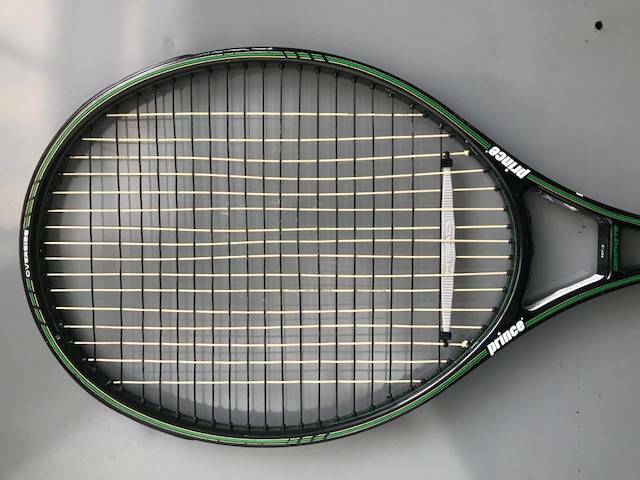 Racquet os Diadem Elevate which has one of the most wide main strings pattern I have ever seen. Just tried V/C and it is BOMB!!!!!! My only feedback is origin 16 is POWERFUL ... fb o 16 red @55 was a rocket launcher ... but o/v @55/52 about right. So if I was trying o 16/cream 1.28 @55/50 probably. Sorry ... never played 17g origin or 1.23 cream. I don't think O/C is a good choice, personally... No spin and too much power... V/C is not too powerful, great control and spin. Did you play it ... I haven't. FB origin 16 red @55 was very little spin for me, but o/v @55/52 tamed the power, and is actually good spin (more than fb v). Seems cream would do the same adding spin to origin and taming it, but you never know until you try it. But yes ... v/c was great spin for me, more than o/v. I just remember an elbow twinge after some hours ... didn't stick with it. Origin is just about as arm friendly as v, probably best tension maintenance other than gut, doesn't fray, nice feel/sound ... checks off a lot of boxes. Don't tried it... But I'm confident about my thinking. Crank up the Origin to 58 and run Cream at 50. @Dartagnan64 do you play with Phantom Pro 100 or Phantom 100? I play with Phantom 100 and a Phantom Pro 93P. And when the mood suits me, a POG 107. The 93P is what I use mostly. What big differences between Pro 100 and 100? Where is the best spin and control? Are you saying Cyclone Tour doesn't go dead on you or you simply snap it before it can? It goes dead about the same time it snaps for me and several 4.0 / 4.5 male clients who it. Sometimes it snaps, other times I cut it out and restring it. Same for multiple clients. Several guys play till it breaks, and one of the "play till it breaks" guy goes through 3 frames a month. Been using it for 5+ years now At less than $7 per frame, it is a great string. Thanks. Do I recall correctly - only 1.30mm? Been experimenting with Velocity crosses and a number of different mains, it’s almost like sweep the shop and any qualify multi or syn gut is going in the mains. It’s all playing well and a much needed break for the arm after a long season with Gut/poly and Poly/Poly. Arm feels fresh and zero pain or stiffness in the elbow. 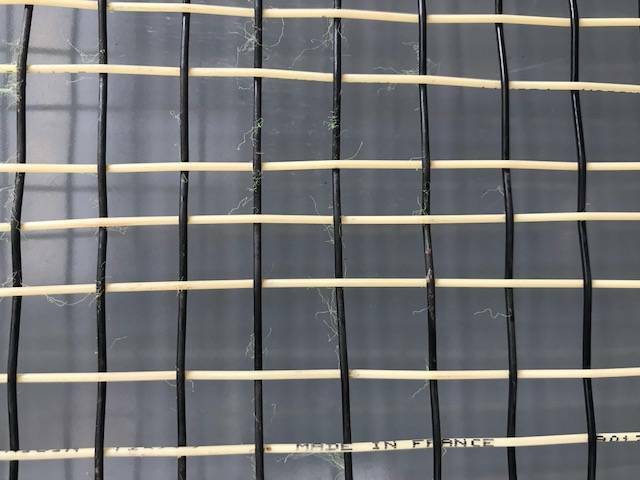 Any reason for stringing PS97s tighter than RF97s? Just curious. Play with the PS97 in stock form so going from the heavier frames to that frame It generates a good bit more racquet head speed. Couple of pounds tension helps to control the ball. Thanks for clarifying; I just asked as it seemed counterintuitive that the heavier, presumably more powerful model wouldn't need to be strung more tightly. The RF97 can tend to feel really stiff when the tension gets too high for me. Tried Velocity/ Weiss Cannon at 55/52 and it felt like a board. Have played poly in the RF97 from 50-52 for awhile and have played the PS97 at 52-54. Just need to read RF97 to feel pain in the arm!! That is true..the wrong string or the wrong tension and it will hurt you. Interested in trying Origin mains after the success I have had with other multi/syn gut strings and Velocity cross. The set up I put in the 6.1 95 18x20 Gosen/ Velocity played excellent. I’m thinking Origin would be a step up in performance from there. I think you are going about it right sticking with a cross, and testing different mains avoiding the infinite hybrid rabbit hole. For those of us who have to avoid all poly, velocity is a decent alternative. I found both origin/v and hdx/v to play great, and both of those mains great on tension maintenance. I keep expecting someone to try X-One/V since X-One is so popular (I have never hit with it). Ive been thinking that after running out of NXT, X-one may be the one to try. Maybe a little more longevity than NXT. I love it when I plant a string seed and it produces. This use to work with @Traffic until he caught on. Thank you guys for sharing the information so that others may prosper. I am playing some decent ball and the arm feels better than ever. Does Origin 17 is so slick as TWU mention it? Maybe fresh off the stringer. But it doesn’t stay slick for long. O/C better than O/V on clay? I would suspect O/C would be better on clay although i've not used it. I've used O/V and L/C on clay and L/C is better since the clay takes off V coating reasonably quickly. O/V is a really good hard court combo but I'd go with poly crosses on clay. O/C would be a really good combo which I might use in my POG 107. O/C would be a really good combo which I might use in my POG 107. Strange that you still not tried it!! Hard time getting Cream so I've been mostly using my limited supply on Legend/Cream in my 93P. The POG 107 hasn't been used much lately and has some fresh O/V in it I don't want to cut out. Next stringing if I've got Cream around. So many strings, so little time. And strings last far longer in my 93P than they ever did in my PD or Blade. 18x20 in a flexible frame makes a huge difference.